But the benefits don’t stop there!! When you book with us, you will also find that you are entitled to special coupons that will get you big discounts on the most booked, most sought after, and most viewed vacation rentals on the island. 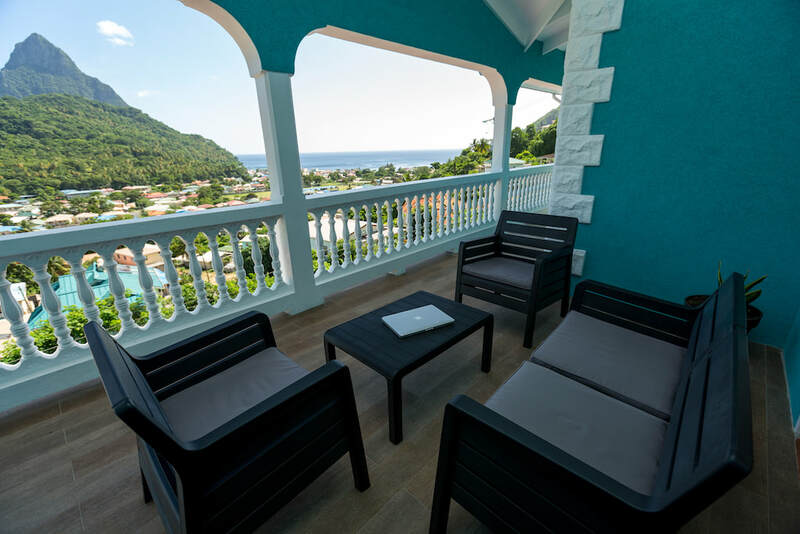 Far from your average hotel room and more luxurious and private than any resort, our Soufriere apartments and villas are a home away from home that provide a VIP experience close to all that the island has to offer at an affordable price. 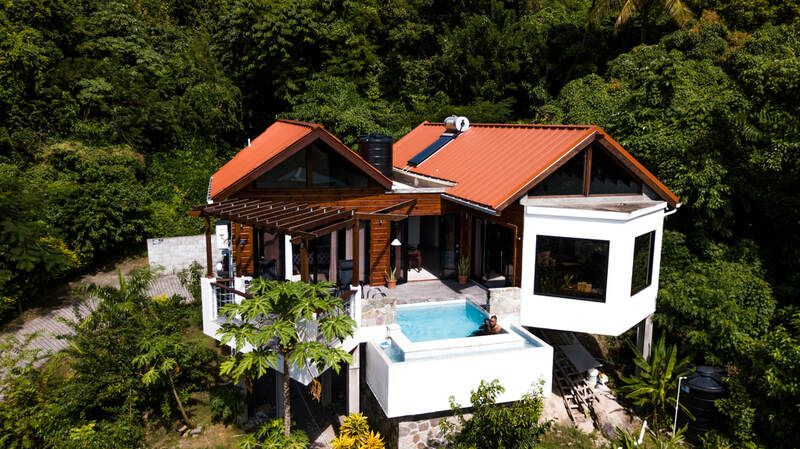 ​If modern design and architecture appeal to you, this villa located in the heart of Soufriere is certain to delight. 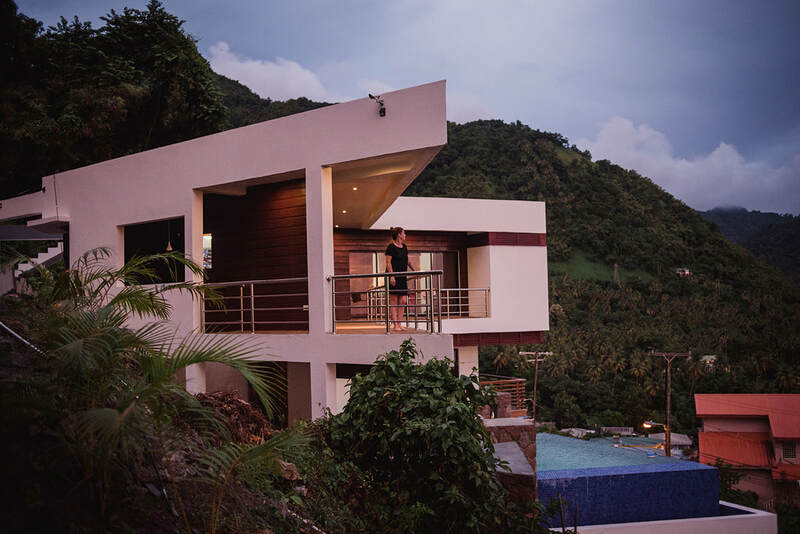 This two bedroom villa offers an infinity pool with views of both the ocean and the Pitons and a design that will take your breath away. Recently built, there is nothing ordinary about this villa and it exudes elegance at every turn. A modern kitchen with stainless appliances almost makes you need to cook, and the rain showers in the bathrooms are so relaxing that you may find that you never want to get out. Both bedrooms are designed for the ultimate in comfort and relaxation, and the sitting area is the perfect place to watch the sun rise and set while enjoying freshly brewed coffee or one of our famous Piton Beers. Request future Coupon..
​With stunning views of the Piton Mountains from many of the villa’s windows as well as from its terrace and plunge pool, the majesty of St. Lucia is always in sight. But you don’t have to look outside to see beauty when you stay at Serrana Villa. This elegantly appointed two bedroom, two bathroom villa offers elegant, comfortable furnishings, a modern and well-equipped kitchen with everything from a stove and microwave to a toaster and a blender. Designed to rival even the best five star hotels, the villa also offers wireless internet with a computer that guests can use for business or to share photos that will make friends back home green with envy. A wall mounted television in the living room puts entertainment at your fingertips, while comfortable bedrooms ensure a peaceful night’s sleep so you wake rested and ready to explore all that St. Lucia has to offer. Request future coupon..
​Island Expo - This private six hour tour is a great way to explore the best of St. Lucia. Start in Castries and make your way to destinations such as Morne Fortune, Government House, Canaries, Anse La Raye, Soufriere, and either Jalousie or Anse Chastanet Beach. There’s something exciting to do at each stop, too, whether it is swimming, enjoying a local meal, shopping, or learning about our island’s unique history. Whether you are looking to explore or would like a sample of all that the island has to offer so that you can decide where to spend the most time during your vacation, this tour is an excellent option. ​Gros Piton Climb- The Piton Mountains are easily St. Lucia’s most recognizable feature. But if you think the view of these majestic mountains is beautiful, wait until you see the view from them. This hike is rated moderate in difficulty and takes about half a day to complete. Don’t forget to bring a camera, as the view from the top is one that you’ll see every night in your dreams! ​Volcano Night Bash- St. Lucia is home to the only known drive in volcano in the world, and this five hour tour gives you the chance to see it up close and personal. How close? You can actually get inside the medicinal mud baths and relax all your cares away while enjoying refreshing alcoholic or non-alcoholic beverages. The tour begins with a lovely drive along the island’s western coast and through beautiful fishing villages before arriving at the volcano. And don’t worry, showers are available should you choose to enjoy the relaxing hot mud baths. Enbas Saut Rainforest Baths- Have you ever wanted to bathe in a waterfall in the middle of a rain forest? If you had never thought about it, we bet you do now! With the Enbas Saut Rainforest Tour, you can do just that. Take a fifteen minute walk through the rain forest while spotting local wildlife, then let the waters flow over you and carry all of your cares away. Don’t forget a swimsuit and towel, but more importantly, don’t forget to bring a camera!!! ​While we are happy to get you to and from the airport (and anywhere else you would like to go), you will find that booking with us also entitles you to discounts on car rentals to help you get where you are going during your stay. All of our rental cars are designed for the island’s terrain and incredibly well maintained and appointed. ​All of our rentals also include GPS to get you where you want to be as well as a mobile phone in case you have questions while you are on the road.